Algerian President Abdelaziz Bouteflika’s decision to seek a fifth term as president has triggered a wave of protests in the Algerian capital Algiers and elsewhere in the country, with some observers saying that the protests, which erupted on Friday and continued over the weekend, could bring the North African nation to the threshold of its own Arab Spring. They foresee scenarios ranging from the postponement of the elections, scheduled for 19 April, to a transition from the system of government that has prevailed in the country since Algeria won its independence from France in July 1962. “After Friday prayers, hundreds of citizens, the majority of them young, assembled in Algiers and other parts of the country to express demands of a political nature,” the official Algeria Press Service (APS) reported. 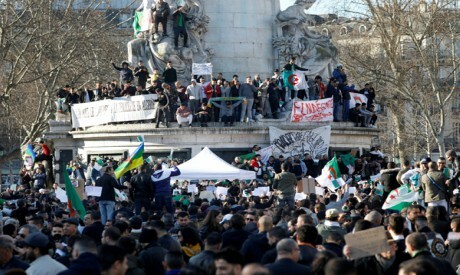 It said that the demonstrators had proceeded to march, “in the midst of an intensive security presence,” carrying Algerian flags and placards saying “Yes to Justice,” “Peaceful Protest,” and “Change and Reform,” and demanding that Bouteflika retract his decision to seek another term. “Several other regions experienced similar marches and rallies without incident,” it added, listing the cities of Annaba, Constantine, Bejaia, Batna, Skikda and Oum Al-Bouaghi to the east and Tizi-Ouzou, Bouira, Boumerdes and Tebaza in the centre of the country. In the west of the country, “hundreds of citizens” took part in “peaceful marches” in Oran, Tiaret, Mostaganem and Relizane, the report said, adding that these had passed off “in a calm atmosphere with no excesses”. There were also marches in southern towns and cities such as Ouargla, Laghouat, Hassi Messaoud, Adrar and Al-Oued, where “peaceful rallies and marches were organised in the main streets,” APS said. The coverage of the demonstrations, reminiscent of those that have rocked Sudan over the last two months, was striking, as if the Algerian news outlet was appearing to encourage “the popular rejection of a fifth mandate” for Bouteflika, in contrast to other domestic media. According to the APS, the police used tear gas and water cannons to disperse demonstrators in the capital to keep them from reaching the Presidential Palace. However, it said that the police had avoided actions that might provoke the demonstrators and had taken preemptive measures by arresting many activists. When Bouteflika announced his decision to run for another term as president on 10 February, he vowed to institute “radical reforms” if he won. However, many have questioned the feasibility of this pledge, not least because the 81-year-old politician spent 80 days in a Paris hospital in 2013 after suffering a stroke and he continues to require regular tests abroad. A recent statement from the president’s office in Algiers said that Bouteflika “will travel to Geneva on 24 February in order to conduct periodic medical examinations.” The statement was released on 21 February and was perhaps deliberately timed to coincide with one of his few appearances in public since 2013. Bouteflika was seen on national television attending the swearing-in ceremony of Tayeb Belaiz as president of Algeria’s Constitutional Council to succeed Mourad Medelci who died end of January. On 2 February, the ruling coalition government in Algiers released a statement nominating Bouteflika for a fifth term in office following a meeting of its component parties, the National Liberation Front (FLN), the majority party headed by Bouteflika, the National Rally for Democracy (RND) headed by Ahmed Ouyahia, the current prime minister, the Algerian Popular Movement (MPA) headed by Ammara Benyounes and the Rally of Hope of Algeria (TAJ) headed by Amar Ghoul. The parties told their supporters to prepare themselves against “any provocation” that might undermine the smooth conduct of the electoral process. Opposition party the Rally for Culture and Democracy (RCD) headed by Mohcine Belabbas called for the resignation of Bouteflika and his government, the formation of a national-salvation government, and the cancellation of the elections. Despite the universal acknowledgement of the peaceful nature of the protests and the appeals for dialogue and restraint from across the political spectrum, the continuation of the demonstrations in Algeria this week nevertheless carry with them the threat of escalation.